The purple “soda” is the key change. In the original, levels were basically limited to the screen. In Soda, levels are multiscreen — a common mechanic is to push a “bear” up to the top past a finish line by raising the level’s soda water. This change dramatically expands what’s possible for a level, and makes way for creativity. If the idea of candies in soda sounds strange and incomprehensible, that’s because it is, but it does work once you get your head wrapped around it. 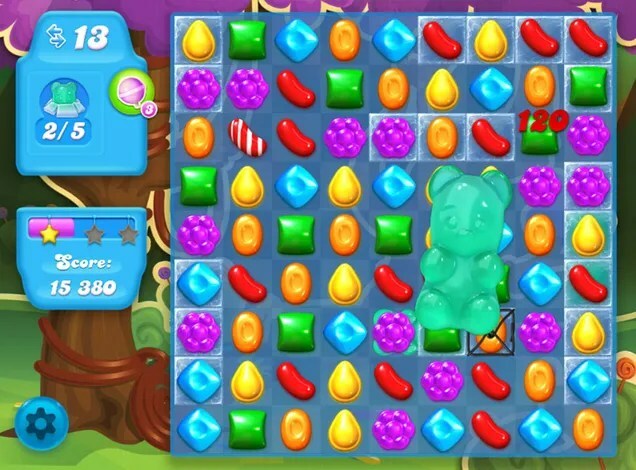 Candy Crush Soda definitely has a steeper learning curve than the original. I also like the “find the gummy bear” mechanic, a scavenger hunt of sorts for gummy bears hidden randomly under candies and ice. It gives the game a certain fun whimsy, whereas breaking all the jellies in the original can sometimes feel like work. There are new candy combinations too. Combining candies into a square gets you a fish; joining a candy wrapper and sprinkled donut results in candies of that color turning into wrappers; etc. The changes all make sense in the context of the game and promote a higher likelihood of candy chains, which I like. I give Candy Crush Soda Saga a B rating. A game worth downloading but unlikely to achieve the original’s cultural impact. The game is fun, polished and generally clever, but it’s weighed down by strange visuals and even stranger metaphors. Candies in soda? Gummy bears hidden under ice? 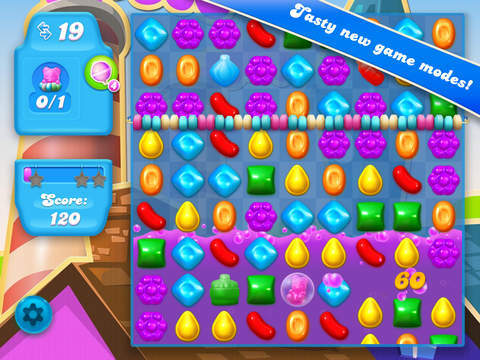 You can’t help but feel this was meant to be a brand new game, with a unique look and concept that makes sense; but which was force fit to be the Candy Crush sequel and now doesn’t quite make as much sense.